I was speaking with a physician about air pollution, and about which types cause asthma, and she was stunned that there is background research indicating that different types of outdoor pollution have differing relationships with asthma. Part of the reason for this was that she didn’t realize how easy it was to differentiate which types of pollution come from which sources. Chemical Pollution is very defined and very small. It’s specific molecules. It’s about 10,000 times smaller than PM2.5. It’s also about the size of the the air we breathe, so you can’t physically filter it. It is things that you’ve heard of, like CO (carbon monoxide), SO2, and NO2 (these both become strong acids in water, which causes acid rain. Note that our lungs are about 100% humid air, so they become strong acids, like battery acid, in your airways). These are extremely difficult to filter, and tend to require chemical reactions (more on that on a later post!). We are focusing on SO2, which just comes with fossil fuels, and NO2, which comes about every time you burn something in our atmosphere (our atmosphere is 78% nitrogen, and 21% oxygen, when you burn things, it uses the oxygen to convert stuff into CO2 and other emissions, but at high heats, it also produces NO2. Higher heats means more NO2). We ignore CO for now, and we ignore CO2 because it doesn’t cause immediate health threats compared to these other pollutants. VOCs are complicated. They are typically things you smell, like the new car smell, new elevators, paint, permanent markers, etc. Some people are highly sensitive or allergic to these. They can typically be filtered by most activated charcoal filters, because the carbon radicals in VOCs tend to adsorb well onto charcoal (ie they bond to it). We are going to ignore this, because we’re assuming you don’t like to leave your child in a freshly painted room, in new cars, or on new elevators. Hokay, so, now we need to discuss which pollution sources produce each. So I’ve made this helpful chart. 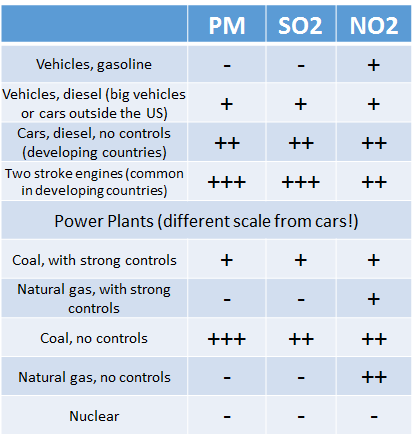 These are relative amounts of pollution within their category, with no clear scaling criteria, but it gives you an idea of how different vehicles or power sources relate in terms of pollution. In other words, a two stroke engine clearly doesn’t produce as much pollution as a coal fired power plant More important, these are rough relationships. You can have a wide range in each category, with a coal plant with no controls that burns high-quality coal producing significantly less pollution than the same design coal plant that burns low quality coal, for example. Power Plants are a lot more complicated. In the next post, I will be discussing pollution controls in power plants in more detail. Put simply, natural gas powerplants produce predominantly NO2. They burn CH4, and convert it to CO2 and H2O. NO2 emissions can easily be reduced by 90% with proper controls (discussed in the next post). Coal fired power plants can be nasty. With no controls and with using low-cost coal, they produce a lot of each type of pollution. PM is the result of impurities in the coal that can’t be burnt, or unburnt specs of coal. Low-grade coal produces prodigious amounts of PM, and contains a lot of sulfur that burns to produce SO2. They produce a lot of NO2. All of this can be reduced greatly simply by building in controlling systems. These controlling systems are used in nearly every coal plant in developed countries and in many coal plants in advanced developing countries. They are completely ignored in nearly every coal plant in many developing countries. Which of these should you care about? That depends on where you live. Most of the pollution in developing countries comes from power plants, but if you live next to a busy street or highway, traffic pollution could be the bigger concern. If you are in a developed country, particularly the US, traffic pollution is almost always the largest concern. Why? Because you are sitting directly next to the source. Whether you’re biking or walking with your infant in a stroller, you are right next to the pollution. The problem exacerbates when you are nearby to a highway or major intersection, because there is a ton of traffic.